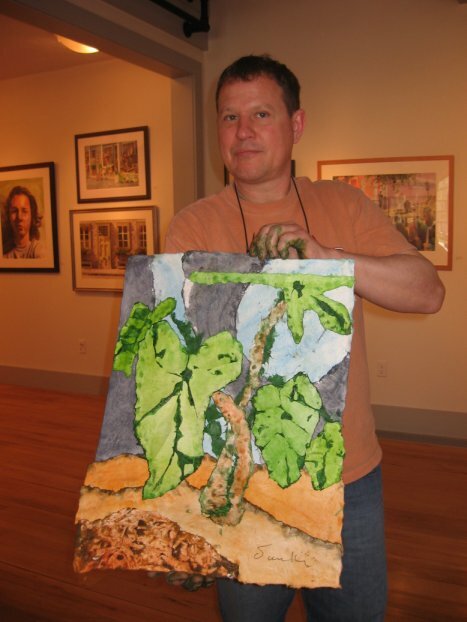 I went over to the Cotuit Center for the Arts yesterday to see a watercolor demonstration by John Krenik of Plymouth. I dabble in watercolor and thought it might be fun to see an artist in action. I was kind of expecting a lesson in how to paint a realistic sky, but what Krenik was demonstrating was a whole new (to me) collage technique (that he has been developing since 1986). It’s called watercolor bath painting. First he drew a sketch based on his white-line woodcut of an elephant ear plant. Then he took a large sheet of special rice paper and tore it in half, down the middle. On one piece, he painted, freehand, with water, the shapes of the objects in the background, and tore the shapes out (assisted by softening of the paper with water). He did the same for the foreground pieces. Then, using mixtures of watercolor paints and water on a glass table surface, he dipped the shapes in the paints. Sometimes he folded or crinkled the paper and dipped the shape again, in another color. It all seemed so simple, these torn shapes, randomly colored. I was wondering how the end result could possibly approximate art. Then he glued the background shapes together and held it up for us to see. The colors were beautiful, the shapes fit together perfectly, gracefully. He added the foreground shapes (many of the pieces were still wet). It was lovely. Not satisfied, he worked on the stems a bit longer, first adding clumps of dark green rice paper. He didn’t like that, and decided to tear out some additional pieces of rice paper, dipping them in the orange-y brown and green water color mixture. The piece was transformed. Perfect! All of this took only an hour or so, making it all look so easy, but I am guessing that my first efforts might result in a sodden lump of rice paper, not a work of art. Still, I might give it a try. Krenik has a larger and more complicated watercolor bath painting at the New England Watercolor Society show, now at the Cotuit Center for the Arts. For more information on Krenik, see his website. The watercolor demonstrations continue for the next two weeks at the Cotuit Center for the Arts, Fridays at noon: Elizabeth Pratt on May 2 and Sally Sawyer Mitchell on May 9. These demonstrations are free and open to the public.They are a great way to learn about the artistic process, and maybe even encourage you to paint, or try new things in your painting.